This abstract patterned quilt is brightly colored and ideal for anyone who wants to add a cheerful atmosphere to the bedroom. The lovely texture and gorgeous array of red, green and blue reflect the colors of nature for a tranquil yet invigorating update. The classic pattern matches well with all types of decor and flooring, especially dark earth tones. Reverse the quilt to the light blue underside and create a whole new color scheme. Beautifully made and will brighten any room whether it needs it or not. My hopelessly brown bedroom is now a place of cheer and I couldn't be happier with my purchase. The quilt is beautifully made and washes and dries like a dream. I put it through 2 wash cycles on cool/cold and bulky settings on my washer and dried it on the delicate setting in the dryer. These colors are actually more beautiful in person than on the photos. Very vibrant, and the reversible teal side is equally beautiful. Well made and just the right weight of cotton and fill to be cozy without the bulk. I would absolutely buy this again. I ordered this comforter for a cabin we are purchasing and the colors are amazing! The bright "happy" feeling it evokes will help during those gloomy weather days. Also trying to update the "cabin theme" no cattails/duck upholstery for us. Once washed the material became softer which why I wanted an all cotton quilt. We received many compliments on the quilt. Nice quilt but could be a few inches wider. i bought this for my gramma who wanted a cheerful bright quilt for her bedroom. This fit the bill! It is a light quilt and is VERY cheery! It makes her smile when she enters her room. Quite a few commented the colors are brighter than shown. The sun is shining thru the window in the picture making the colors look more muted. See the side of the quilt hanging on the floor... more accurate because no light is hitting it directly. Dimensions of each size are given. Compare those to your mattress for a proper fit. This bed is not made, quilt does not go to floor. Shams are reversible with a zipper closure. The zipper was stuck in both shams. Overstock replaced them very timely considering it was during the Christmas rush. My client is very happy! Highly Recommend... Also Overstock's Customer Service is the greatest in all areas. Nice light weight durable quilt. I purchased for light weight summer use which works good for this purpose. The quilting is small squares which prevents the filling from bunching when you wash it often as I do since our small dog sleeps on the foot of the bed.. The quilt washes and dries quickly and has held its shape thru repeated washing. The vibrant colors have not yet faded. The picture shown tells the story about its smaller size. The king size covers the mattress with only about 6 inches on each side and does not extend down to meet dust ruffle. The length is sufficient. It appears durable enough to last thru 2/3 summers of heavy washing. The shams are too small for standard pillow and cheap zippers. I sewed the shams into throw pillows size covers. Width and shams was the reason I gave it only good rating. The zipper on the shams is very small and when I first put it on the pillow, I was afraid it would break. It did after the first day of use! I now have to take it to have the entire zipper replaced which will end up costing me more so the value of the quilt set is no longer there. Very Picky but Very Satisfied!! I have a queen bed but went with the king after reading the other reviews. This was a good decision because I really didn't want to use a bed skirt. Worked out nicely. The colors are vibrant. The "blue" is turquoise, which is what I thought from the picture and am very pleased with that as well. I read other reviews concerning the thickness; it is thin but I knew this as I have ordered before. 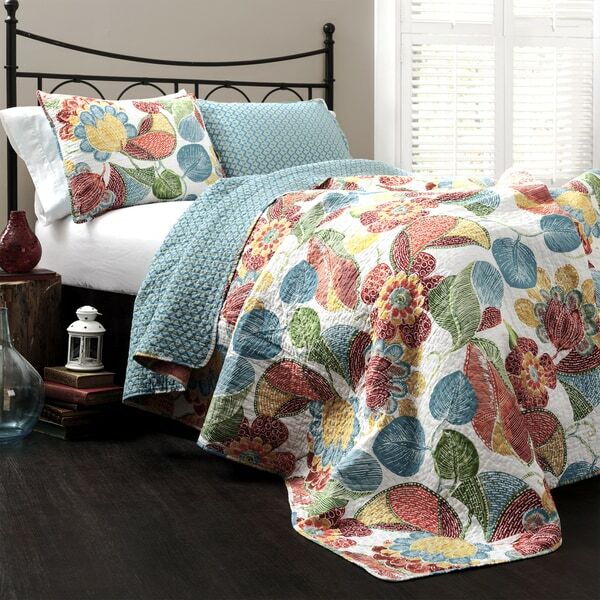 In my opinion, it should be called a coverlet but I didn't buy it for warmth, I bought it for the look and colors. You could always put a warmer blanket underneath of it. I am completely satisfied with this product and would order again. The shams have zippers. I don't think I would stuff the shams so tight that I would struggle with the zipper as it is a thin zipper but it is a sham, not a pair of pants. This is exactly what I thought it was and I LOVE it!!! The only problem I had with this, which was a big one, was it was not the colors in the picture online. The orange was actually neon. What looks like a blue, is turquoise. I didn't really pay much attention to the quality bc I was so disappointed in the difference in colors. I returned it. I also returned a shower curtain that I ordered at the same time. It arrived a few days later and same exact problem. It looked nothing like the colors online or on the package. I won't order again. The colors are vibrant even after washing several times at home. No dry cleaner needed here. Being cotton & living in Florida it gives just enough warmth on our cooler nights in winter. My Basset Hounds also give paws up for being comfy. I'm super happy with my summertime quilt purchase. It looks great, and it's the first time we haven't slept hot! I was a little nervous when I first got it. I do not like it in the package. But as soon as I put it on our bed- bam! Even my husband loves it! If even goes down plenty long on both sides of our king size bed. Like the quilt and the weight of it is perfect. The only thing I wasn't crazy about is the photo shows the colors being much deeper than they truly are. Quality, soft, beautiful vivid quilt. It looks awesome ! Love it, this is my 5-6? quilt and every one I have loved !!!! Nice lightweight quilt with beautiful bright colors. Well made and very attractive. We bought this set to use in our motor home and we love it. The colors break up all the brown that RV manufacturers use so much of, and the weight is perfect. A great purchase! The colors in the quilt are so vibrant, great buy. I purchased this specifically for my 10-year-old granddaughter to use when she comes for a visit. I have a second twin bed with a completely different bedspread set. When she saw this one, she immediately claimed it as her own. Success! It's cheerful and inviting. Lightweight. Seems to be easy to care for. 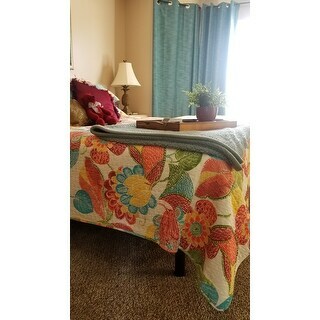 Love my beautiful blankets and are perfect for summer weather. Good quality however the quilt is a little small for the average king sized bed. If you have a room where you can hide the "short side" of the quilt then it will be fine. If both sides are exposed, then you'd better look elsewhere. Colors are more brilliant than the picture. Love the quality and weight of the quilt. The quilt has been washed three times and has held up very well. Bought this for our camper bed. Gets a lot of washing and always stays beautiful and colorful. This is also a nice thickness. Not too thin or too thick. "What other accessories can you purchase with this set?" Lightweight and fairly soft. Will most likely be softer once it is washed. "I have a queen pillow top mattress. Will the queen quilt cover it properly? Vicki"
I would recommend that you measure to ensure the proper fit. The queen is approximately 88 inches wide x 92 inches long and the king is approximately 108 inches wide x 92 inches long. "I would like to purchase drapes that will match well in color with this ensemble. Do you have any recommendations?" cheerful spring colors. Lighter weight than a comforter. Price was very good....color was what I was looking for....colorful without being too bright.....will use in guest room. Fell in love with the design! "Love this colorful quilt. Can you tell me if the reds in it are a true red or does the red have some purple in it making it a bit more cranberry color?? I can make it work if it has some cranberry-type color in it." We try to represent the colors of our products accurately. Unfortunately, due to the difference in monitor colors we cannot guarantee that the color will match exactly what you see on your screen. In my opinion it appears to be more cranberry than true red. "is the white a bright pure white or is it a little more on the ivory/cream side?" I would describe the white as a pure white that shows off the colors of this quilt.